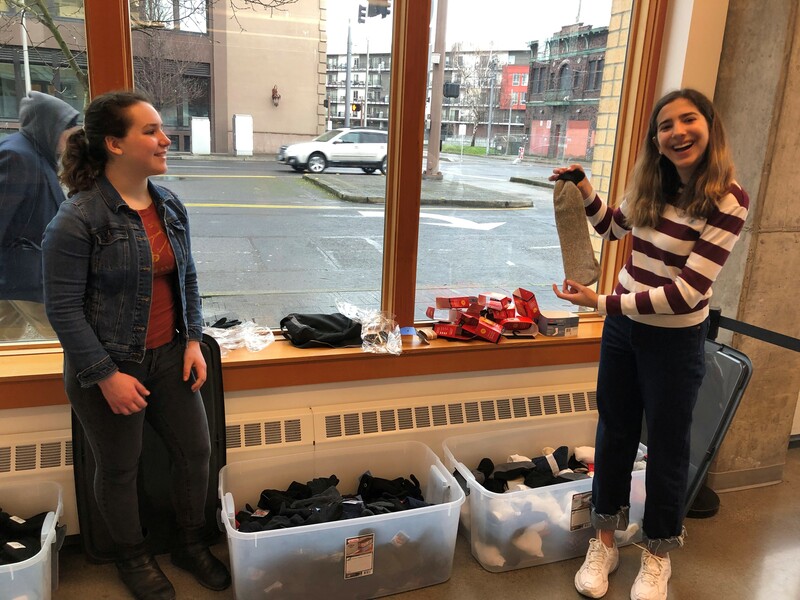 This past month I have been collecting socks, gloves, and hats to pass out at a Blanchet House meal service. The initial idea was to organize it solely through my BBYO chapter but it ended up expanding to my family, friends at school and my parent’s work. By spreading the word face-to-face and through social media, I received over 200 donations of each item! I decided to do this drive because although Portland is not known for having the coldest winters compared to other cities, in recent years it is not uncommon to receive snow, ice and frigid temperatures. I wanted to help the expanding number of people I see on the street each day, and while this small gesture won’t come close to solving the whole problem, it may bring a bit of comfort to the individuals who are living out in the cold. I hope that this gear can help as many people as possible to stay warm during this cold winter and that it can inspire others in the community to reach out as well. I handed the gear out with my fellow ambassador Olivia DiGiulio, along with two of my friends and it went really well! There is still left over gear but socks were definitely the most popular. -Written by Zoe Jacobs. Zoe is a Blanchet House student ambassador and Lincoln High School student.